I spent last weekend with a bunch of amazing people in Dorset! As part of A Level Geography, we set off on a 4 day weekend to the not very sunny, not very exotic Swanage. The weekend was absolutely amazing - I laughed non-stop for the whole weekend, made so many new friends and become closer with others. During the weekend we went on several day trips, to many places, one of these was the quaint village of Lyme Regis. The weather was horrendous all day, but it didn't steer us away from the beauty of the town. The beautiful coloured buildings looked like the streets of Balamory, and the streets were lined with cute cafes and lovely shops. We walked around the town, across the bridge over a little waterfall and alongside the small river that flowed through the village. The rain continued to pour down and the wind began to pick up again so we took shelter in a lovely café called The Gallery. Looking like drowned rats we sat down at a table and chose off the menu. I ordered a deluxe hot chocolate - a no brainer - to provide me warmth and a sugar kick. 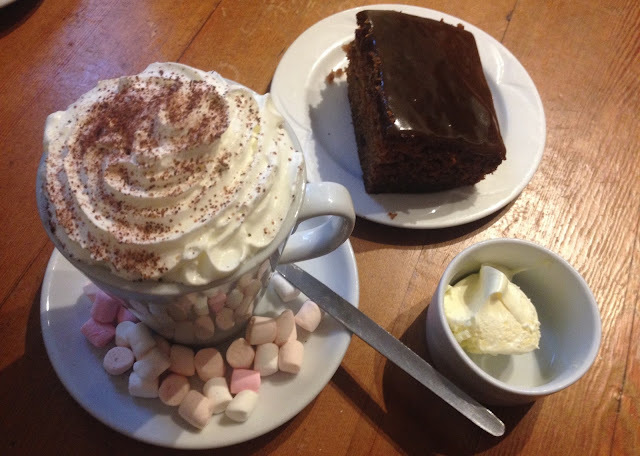 It was a brilliant choice as it was one of the best hot chocolates I have ever tasted! To go with my hot chocolate, I chose from a selection of homemade cakes. I opted for a warm sticky toffee pudding with local clotted cream - it went down a treat! Two of my friends decided on cream teas, and my other friend chose the savoury option of a bacon roll. The Gallery was such a wonderful place to relax, and it was the perfect pick me up before we headed back out into the town of Lyme Regis, to battle against Storm Imogen. Lyme Regis is such a beautiful village in the South coast of England. There were so many quaint cafés to try and the beach there is lovely. I would love to return again, perhaps in the summer when the weather is sunnier!